For too long, women have been told that we are terrible at being friends, that we can’t help being cruel or competitive, or that we inevitably abandon each other for romantic partners. But we are rejecting those stereotypes and reclaiming the power of female friendship. In Text Me When You Get Home, journalist Kayleen Schaefer interviews more than one hundred women about their BFFs, soulmates, girl gangs, and queens while tracing this cultural shift through the lens of pop culture. Our love for each other is reflected in Abbi and Ilana, Issa and Molly, #squadgoals, the acclaim of Girls Trip and Big Little Lies, and Galentine’s Day. Schaefer also includes her own history of grappling with a world that told her to rely on men before she realized that her true source of support came from a strong tribe of women. Her personal narrative and celebration of her own relationships weaves throughout the evolution of female friendship on-screen, a serious look at how women have come to value one another and our relationships. Text Me When You Get Home is a validation that has never existed before. A thoughtful, heart-soaring, deeply reported look at how women are taking a stand for their friendships and not letting go. Kayleen Schaefer is a journalist and author of the bestselling Kindle Single memoir Fade Out. Her work has appeared in The New York Times, Vanity Fair, The New Yorker, Vogue, and many other publications. 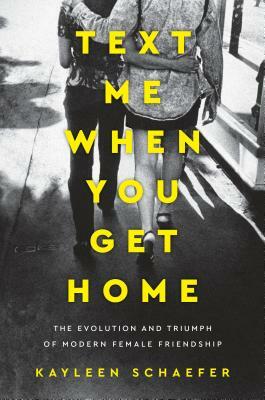 She currently lives in New York City, and Text Me When You Get Home is her first book.